A- Appreciate. Appreciate good mental health days. Make the most of them. Don't feel guilty that you are having a good time or worry that it will only mean that something bad will happen Afterwards. Appreciation of the small things is also incredibly important. 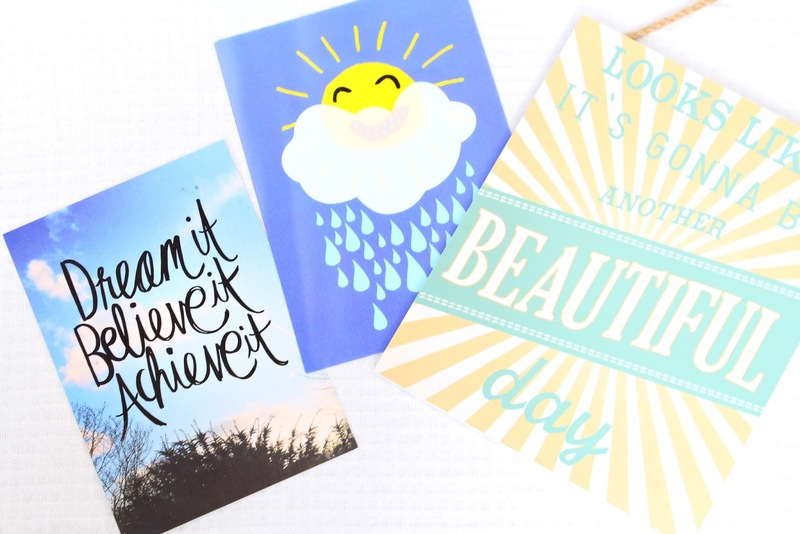 Write a thank you card or send a tweet to someone you really appreciate, out of the blue. Not only will it make you feel better it will also bring a smile to someone else's face! B-Breathe. We all breathe. Duh! Otherwise, we wouldn't be here. However, breathing is something we don't pay an awful lot of attention to. If you suffer from anxiety, panic attacks or high-stress levels- finding new breathing techniques and practicing them is really important. Just set a couple of minutes aside a day to practice your breathing. (Calm is a fantastic app to help with meditation , breathing techniques and mindfulness) Once you have learnt some techniques you will be able to apply these to real-life situations when you really need them. C- Compliment. Whether you are feeling brave and want to compliment a random stranger in the street or a friend you have known for ages! Spread some love and you never know you might make someone's day. D- Donate. Donate something, anything to charity or a women's refugee shelter. Clothes, books, old technology, games etc. The list is endless! You can also donate money to different mental health charities. Charities need this money! Trust me it goes a long way! E- Educate. Education is powerful. Whether you are educating yourself about mental illness through books, YouTube or podcasts or educating others. You can educate others by leading public speeches, spreading awareness of the effects of mental illness or just correcting someone when then use mental illness incorrectly. E.g. "I am so OCD" or "I am so depressed because all the pizza is gone" talk to them calmly about the terms they are using and inform them about what they actually mean. F- Forgive and forget- we all hold grudges against some people. Most of us have unsolved arguments. It's time to change this. Holding on to grudges just adds stress onto us we really don't need! Be the big man and message that person. Get it over and done with. If you don't have any unsolved arguments you can forget all the bad things you have done wrong in the past. Write them down and rip it up, burn it if you must. You can't change the past but you can make a difference to the future. G- Gratitude. Write and keep a list of all the things you are grateful for. You can come back to this as often as you like when you think of new things. The more the merrier! H- Hug. This one is really simple and pretty self-explanatory. People underestimate the importance and power of a good hug. Give someone you love a hug out of the blue for no reason. Most people will really appreciate physical love and affection. I- Indulge. It's okay to indulge in your favourite food or TV programme every now and again. We all deserve a treat every now and again. Have a movie day with the biggest pot of Ben and Jerry's ice cream you can find and don't feel any guilt whatsoever! J- Journal. Writing down your thoughts and feelings is so important. Sometimes we don't want to feel like we are troubling others with our mental health. It's imperative that we don't keep all these emotions inside us, though. Writing is very therapeutic and keeping a mood journal can be very handy when talking to a therapist about your mood over the last few weeks. K- kindness. Kindness is so important. Most of us would like to think we are kind people but how often do we actually practice it. With the rise of the digital age, why leave a comment when a favourite or a like will do? A comment means so much more than a like. Comment on someone's profile picture. Encourage someone to keep working hard towards their goals or provide a virtual shoulder to cry on if someone is having a bad day. L- Laugh. Watch your favourite comedy. Find some really cringe-worthy jokes and tell them to your friends and family. Do something fun or silly with friends and take lots of photos. Laughing releases chemicals that do wonders for your mental health and stress levels. M- Mindfulness. Sit down and relax. It can be easy to get caught up in the hustle and bustle of everyday life. This is why sometimes we need to sit down and breathe. Stop and rest to let our brain catch up with our body. Mindfulness can be practiced as little or as often as you need it. N- No social media day. Social media is great. I spend all day on social media because it genuinely brings me happiness. I chat with all my blogging friends, who mean the world to me but every now and again we need a social media detox. Have a day with no social media at all and see how you get on. O- Outdoors. Fresh air does wonders for your mental health. I know it can be hard to leave the comfort and safety of your bedroom. But there's a big world out there waiting to be discovered. Take a walk in the park, a trip down to the woods or a cycle in the countryside. P- Pledge. Pledge to end the stigma around mental health. Here are some you can sign: Time To Change Pledge Wall and Okay To Say and they take literally no time at all! Ending the stigma around mental health is so important. Every signature counts. Q- Query and question. Find out more about your mental illness. There are so many amazing websites out there which provide fantastic information on different mental health conditions. If you know someone with a mental illness at work or a friend who is suffering and you don't know much about it. You too can Google the condition and find out a bit more about it to help support the suffer. They will be very thankful! R- Rest. Rest, sleep, and breaks are so important. You wouldn't go into battle on a couple of hours sleep! So why go to work, school or uni on only a couple of hours sleep? It's not just sleep that's important! So are breaks! Your lunch break is there for a reason. You need to take it and not work through it. If it means turning your computer off or moving yourself away from your workspace then do it! S- Support. If you have a mental illness, you have a story to tell. You have experiences which you can use to help others going through similar situations. You probably have advice and tips on all sorts of things regarding mental health whether that be how to tell a close family member or how to get through a bad day. Share these! Go on support forums on mental health websites and reply to people's comments and questions. You never know you might really help someone out! T- Talk. Talk to someone about your mental health. Whether you go and make a doctors appointment for the first time to discuss your mental health. Or your therapist or simply just a family member/ friend. It's important to talk through your emotions and feelings- no matter how small or irrelevant they may seem. U- 'You'. You are important. You are worthwhile. It may not seem like it at times but trust me it's true. You are a beautiful human being and deserve to be happy and lead a fulfilling life. Write a list of the things you like about yourself. Write a list of all things you are good at. Write a list of all your goals. It may seem selfish but self-love is SO important! V- Volunteer. Not only is it great for your own mental health because you are giving back something to the community you are also helping potentially brighten someone's day. There are lots of different mental health charities that are always looking for volunteers. W- Write. Writing and sharing your own personal battle against mental health isn't for everyone but it's worth a try. Not only is it great for the suffer to get thoughts into writing. It's also beneficial for those going through similar situations who can be reassured by your story. Whether you write for your own personal blog or for a website like OCD stories or Time to change etc. It's all really worthwhile and important. X- 'Explore' I couldn't think of anything that began with X so we are going with 'Ex' for now! Explore the world around you. Travel, see the sights, experience new things and different cultures. Sometimes experiencing different cultures can help put your own problems into perspective and sometimes they aren't always as bad as you think. Explore a new hobby. Sign up to a club and you never know you may have a secret talent you never knew you had. Finding new hobbies and keeping busy is a great distraction from mental illness. Y- Yoga. Yoga, meditation or any form of exercise is really beneficial for the brain and your mood. It releases endorphins which boost your mood and make you feel really good. You don't have to start going to the gym every day or train to do a marathon. Exercise can be done from within the comfort of your own home. Set-asides some time every day or week to do a little bit of exercise, nothing too stressful or tiring. Z- ZZZ... Sleep is so important for everyone no matter what age you are. Whether you have a mental health condition or not. We all obviously sleep but maybe try getting some more sleep, going to bed earlier, having down time before bed etc. or keeping a record of your sleep, if it's disturbed etc. You can keep a record of your achievements or if you have done anything on the list in a notebook, share it on Twitter or document it in blog posts, if you are a blogger. I made sure this challenge was suitable for everyone regardless of your age or whether you are a blogger or not. I think I am going to document my progress on Twitter and when I complete all of it (hopefully) I will do a blog post all about it, sharing with you how I achieved each one. I would love to know if any of you guys are going to try this challenge and if you do, please keep me updated with your progress! I would love to know how you get on! Feel free to tweet me @thriftyvintage_ at any time or send me any blog post links with your updates for this challenge, I look forward to reading them! 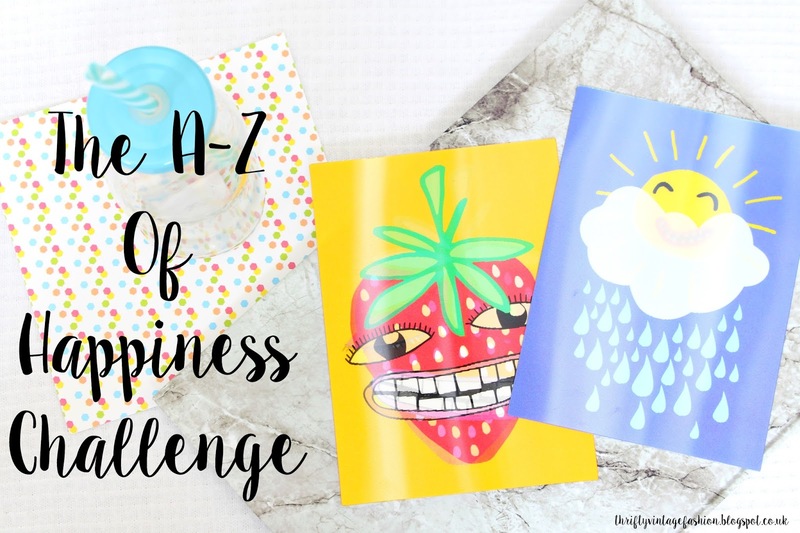 What do you think of the A-Z happiness challenge? Do you think it could help you? Are you willing to give it a go? Let me know in the comments below! I'm currently writing up my list to give this a go. I'm still working on the 101 in 1001 challenge too but I feel like I need something to boost me through how down I'm feeling atm. This is truly inspiring. 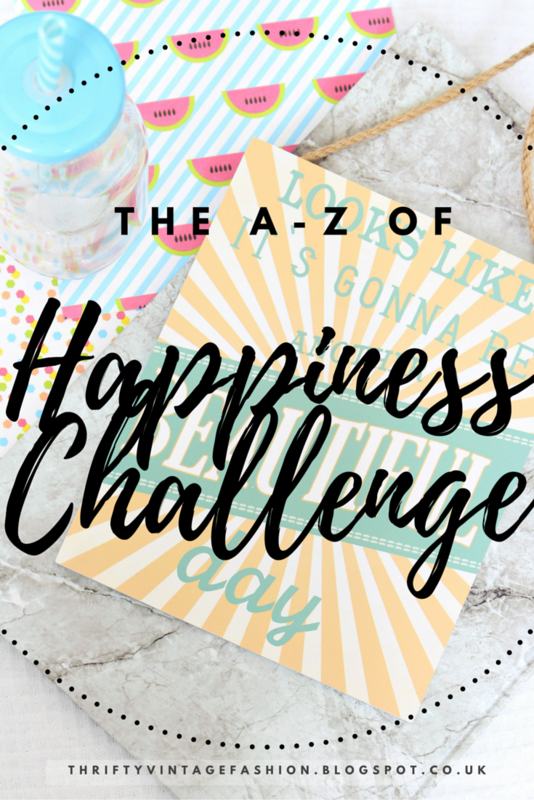 Such a lovely idea and awesome way to harness your own happiness. Will be sharing this for sure. thank you.